Today, known only as Chanel, the House of Chanel denotes elegance, class and a style, developed over time, that revolutionized the dress of the modern woman. Gabrielle "Coco" Chanel (1883-1971) was born to working parents, but as life has other plans at times, Gabrielle (age 12) and her two sisters ended up in a religious convent and orphanage. Her mother had passed away and her father just couldn't handle 5 children, so the girls were sent to the orphanage and the boys shipped off to be farm laborers. From such humble beginnings, but well trained in sewing at the orphanage, Gabrielle went on to making it her mission to change the way women dressed. She felt that women were wearing what men had designed and she wanted women to change their relationship with their bodies and their way of life, offering freedom from corsets and the restricting underpinnings of her time. Coco has been quoted many times, but one of my favorites is "In order to be irreplaceable, one must be different" and that is exactly what she portrayed. Her personal style was neat, clean and elegant. Shorter skirts and softer lines; her use of jersey fabrics; the mix of fine jewelry with costume jewelry, and two-toned shoes; are just a few of the revolutionary changes that she made in women's fashion by just being herself! Gabrielle invented the "little black dress", trimmed down the style of hats, and invented the iconic boxy jacket. She was the first designer to have perfume made for her, the famous and everlasting Chanel N°5. Coco's legacy continues under the lead of Karl Lagerfeld, keeping the House of Chanel on the leading edge of style and elegance. A puffy square-shaped central component with a beautiful CZ cushion cut nestled inside; an open three-dimensional rectangular shape, and a puffy square-shaped pearl drop make up the pendant. 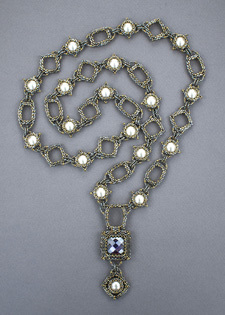 Pulling from the design of the pendant, the chain is made of smaller rectangles, squares and pearl cabochon links and worn long, in the style of a sautoir. Coco said, "Keep your heels, head and standards high", so I think she would be pleased.